If you’re not a native English speaker but need to use English for business, you’ll need a way to check your writing for mistakes. Whether you’re writing an important business email for clients or writing a blog post for your website, you want to make sure your English looks great and presents yourself and your company in the best possible light. With that in mind, there are times when using an automated grammar checker (like Grammarly) is best, and other times when you need something a bit better to check the quality of your writing. We’ll go through the pros and cons of each approach, and discuss when you’ll be ok using an automated grammar checker, and when it would instead be best to go with a service that provides real, native English speakers to edit your writing. First, let’s talk about the pros and cons of each approach to perfecting your writing. Then, we’ll talk about what situations you might want to use each service. One of the major drawbacks to Grammarly is the quality of the grammar check and its suggestions. This isn’t specific to Grammarly, but is true of all automated grammar checkers. Grammarly and other automated grammar checkers only catch about 15-20% of mistakes non-native English speakers who speak up to a C1 level of English make, and about 35% of mistakes C2 English speakers make. This means that, after running your document through Grammarly as a non-native English speaker, your document will still have 65-85% of the mistakes in the original document, with mistakes ranging from vocabulary choices (using the wrong word, even if it’s grammatically correct), to poor or awkward sounding sentence structures, to grammar mistakes the grammar checker simply misses. Another major problem of automated grammar checkers related to quality is the lack of contextual awareness automated checkers have. This can strongly affect the quality of your writing in English, as automated grammar checkers only look at your document one sentence at a time, rather than understanding the context of your writing and choosing the best vocabulary and grammar choices to match your writing style and to avoid mistakes. For example, in the following sentence: “Athletes keep get a lot of attention due to their raw talent and athletic ability. It, in turn, helps promote sports to children.” An automated grammar checker wouldn’t catch anything wrong here, but a native speaker would quickly realize the word ‘it’, should be ‘this’. 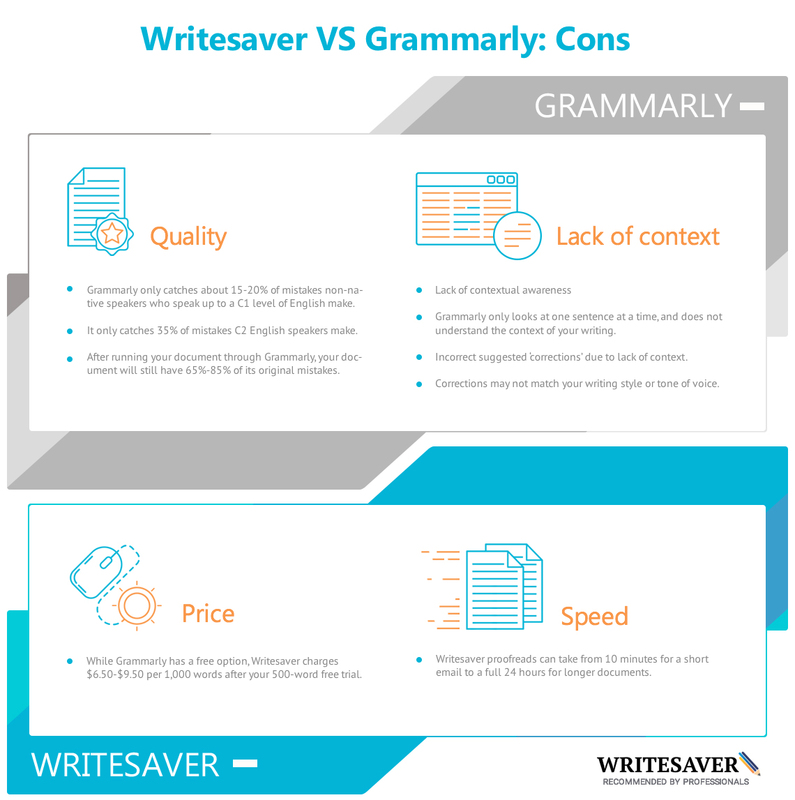 Now that we’ve gone into some of the pros and cons of Grammarly, let’s compare them with a proofreading service like Writesaver, which uses real, native English speakers to proofread your writing. With increased quality comes an increase in price. Unless you have a native English speaking friend on call 24/7, chances are you’ll need to pay for your proofread. Proofreads from a native English speaker can range from $0.0065 per word with Writesaver’s subscription options ($6.50 for a 1,000-word blog post), to up to $0.05 per word for some other proofreading services, which may also offer services like reference and plagiarism checking, or professionals that can edit technical/legal documents). Another con to human proofreaders is speed. No matter how fast a real person can proofread, they can’t edit as fast as an automated grammar checker can. Proofreads can range from 10 minutes for a short email to a full day for longer documents, but regardless, you’ll need to wait a little before your edit is complete. One of the best things that can be said about Grammarly is they have a completely free option (though you do need to pay for premium services and error checking). This makes it an affordable and low-risk solution for checking grammar. It’s also great for learning common mistakes you may make in your writing and using the immediate feedback to limit those mistakes in your future writing. Another great benefit of Grammarly is its speed. After you input your document it shows you your mistakes immediately, so there’s no need to wait around for a friend or professional proofreader to look over your writing for you. Sometimes, like when drafting a quick email to a friend or colleague, writing a personal twitter post, or just jotting down some notes, all you need is a quick check to make sure your thoughts are coherent. In these cases, Grammarly is great. While Grammarly lacks in quality of their grammar check and editing, a real native speaker will catch all of your mistakes and make your writing sound as though it was written by a native speaker (or as close to it as possible). They’ll fix your awkward sentence structures, fix poor vocabulary choices, edit your grammar, and overall make your writing sound professional. A professional proofreader/editor will also be able to edit your writing in context. This means maintaining the tone of voice you have in your writing, and choosing the right vocabulary to keep your tone of voice, in addition to using context to understand your writing and making your overall documents more coherent and fluid in context. As you can see from the lists above, if speed and price are most important to you, an automated grammar checker could be your best bet, while if quality is important, you should go with a real person at Writesaver. With this in mind, here’s a list of guidelines for when to consider using an automated grammar checker, and when you really need to use a real person. First let’s tackle emails, the most common form of online communication. Whether you should use an automated service or a professional proofreader depends on the type of email you’re sending, and your level of English. Let’s dive into some different emails you might be sending and what you should be using for each. This assumes you have a C1-C2 level of English, but applies if you have a slightly lower level of English as well. If your English level is B1 or lower, you should consider hiring a translator rather than a proofreader for any professional documents in English to make sure they are written as well as possible! Chances are, your friends don’t care about your grammar mistakes. Just use Grammarly to see if there are any major glaring mistakes in your writing. How well do you know them? Do you want to do business with them in the future? 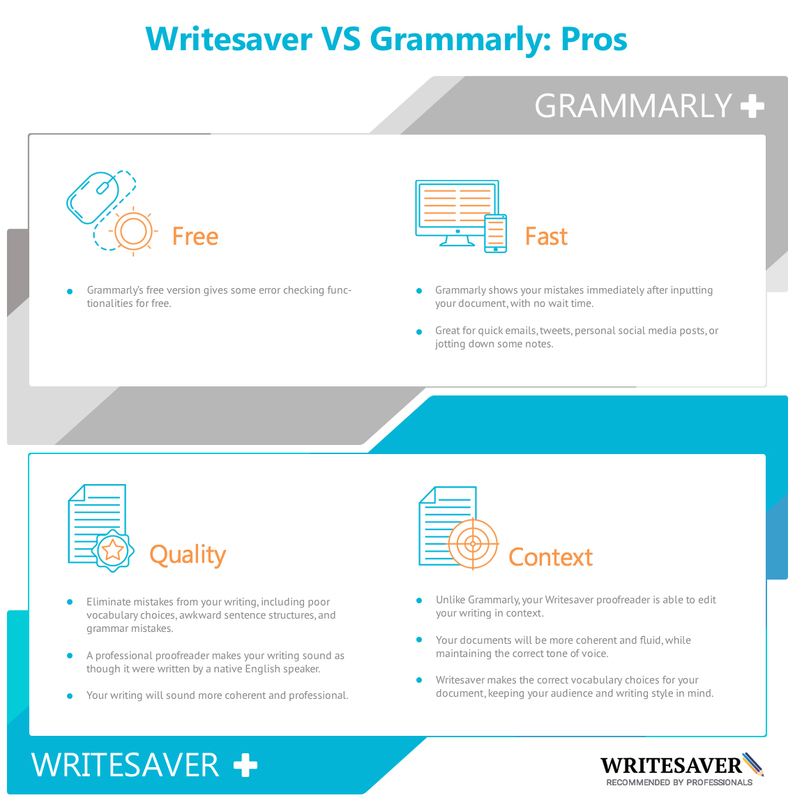 If you know them well, chances are Grammarly is enough, if they’re someone you’re looking to do business with, you’ll come across as more professional and intelligent by using Writesaver to perfect your English if you have time for it. Other personal emails: Generally for personal emails, the speed of Grammarly is ideal, but if you’re writing an email that is especially important you should consider using a real proofreader at Writesaver. When writing to someone within your company, Grammarly should be enough to get rid of the major mistakes. 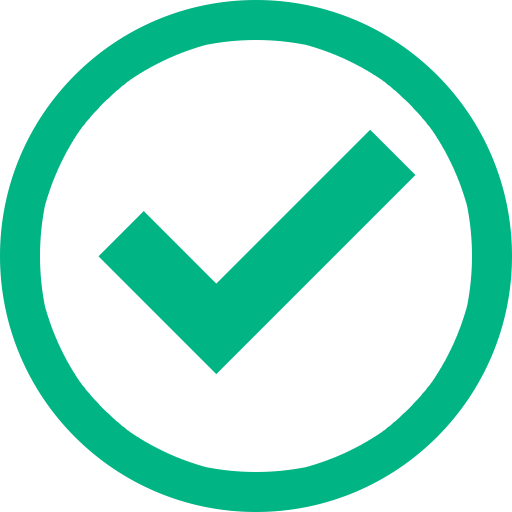 Vendors want to do business with you, so chances are using Grammarly on its own is just fine! The exception is if you’re giving complicated instructions (like to a software developer). If this is the case, Writesaver can make sure your message is clear, and it’s definitely worth getting rid of any potential headaches later on. If you’re writing a short note to a current customer, especially if they are satisfied with your service, Grammarly should be just fine. When you’re dealing with complaints, it’s worth having your documents proofread by Writesaver. Disgruntled customers will jump on anything to complain about, and English mistakes will be taken as a sign of incompetence if customers are already having a poor experience with your product! Always use a proofreader if you have time, especially if your customers are especially high value. If you work in software development or another service business and English isn’t your first language, you should be using a proofreader for every email to potential customers! English mistakes will make your potential customers question how easy it will be to work with and communicate with you, and in a world of outsourcing companies with less than perfect English, great, native English is an easy way to stand out from the pack and win more business. There’s no excuse not to have perfect English in emails to clients that could potentially earn you thousands of dollars, especially for less than a dollar per email. Use Writesaver here, you won’t regret it. Generally for your personal social media, Grammarly works just fine. This applies to Facebook, Twitter (usually), Instagram, and just about any other accounts you have. But there is one key exception. If you use your personal accounts for business purposes (e.g. you are a Twitter/Instagram influencer), you should use Writesaver to make sure your posts are written in correct, native English. LinkedIn is a professional network, and as such, you need to put your best foot forward. Use Writesaver for your LinkedIn profile, since it will be seen by future business partners and potential employers. Whether your site is for your business or a personal page, it’s going to be up there for anyone to see! Get your copy checked with Writesaver. Much like your website, these are going to be online for all to see. Do you really want your customers reading an article filled with English mistakes? Plus, you spend so much time writing and researching these articles, why publish them with mistakes. Use Writesaver here. For much the same reason you want to have emails to potential clients edited by a native English speaker, you should get your business proposals and presentations edited by Writesaver as well. Don’t let English mistakes be the reason you lose a potential client, it’s just not worth it. Hopefully by now you can see the trend. If you’re jotting a quick note to a colleague, chances are Grammarly is just fine to make sure you’re not making any glaring mistakes. But if what you’re writing is important, and will become a reflection on you or your company, whether it’s an email to a customer, a blog post, a business proposal, or website copy, use Writesaver and make sure all of your mistakes are gone and your writing is crystal clear.